By Karl Deering, CARE International’s Climate Change Coordinator for Africa. This post is part of a series produced by The Chicago Council on Global Affairs, marking the occasion of its fifth Global Food Security Symposium 2014 in Washington, D.C., which was held on May 22. In March 2013, rain fell in Namizope and Mukuvula communities in Angoche District, Nampula in Northern Mozambique until the water was almost up to people’s knees, inundating fields and crops. With entire harvests of cassava washed away, the impact for some was catastrophic. However, after the rains, Mwancha Amisse and her husband, smallholder farmers in Mukuvula community, saw how a number of their plots responded differently to the flooding in terms of water flow, erosion, and moisture absorption. They noticed that plots where farmers had implemented conservation agriculture techniques performed far better in the flood than other fields. Those techniques, learned through a CARE-supported Farmer Field School, have increased the capacity of poor smallholder farmers in coastal Mozambique to manage increasingly erratic weather – just one of the impacts of a changing climate. The coastal area of Mozambique is a challenging environment for smallholder farming. Soils are mostly sandy with low fertility, and rainfall is unpredictable, causing drought and floods. Cyclones are another hazard. 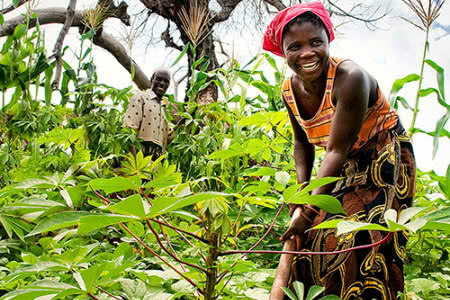 However, farming is still the main source of food and livelihood for most rural families and there is good potential for smallholder farmers to improve yields, their family’s nutrition, and their resilience. This is why CARE Mozambique has been working with local partners AENA (National Association of Rural Extension), Mahlahle (a local NGO), and the Ministry of Agriculture to improve farming practices and productivity in Nampula and Inhambane provinces. New techniques and more productive and disease tolerant crop varieties are being introduced through a participatory approach to research and extension services called Farmer Field Schools. Farmer Field Schools guide farmers to undertake practical experiments and side-by-side comparisons between common farming techniques and conservation agriculture practices. Farmers test different varieties and arrangements of crops for yield, flavor, and disease resistance. They then select those that are most appropriate for their own situations, giving them more control of their land and produce in difficult and changing situations. As they gain experience in running and analyzing their own experiments, farmers build confidence and deepen their capacity to adapt to economic and environmental changes. So what is conservation agriculture? Put simply, it helps farmers to mimic – rather than control – nature through minimal soil tillage, year-round soil cover of organic matter, and increased diversity of planted crops. Conservation agriculture builds organic matter, improves the soil’s structure, reduces erosion, helps water soak into the soil more quickly, and reduces water loss through evaporation, all while improving fertility and productivity. This is vital, especially given climate change impacts, with higher temperatures, more erratic rainfall, and bursts of torrential rainfall alternating with prolonged dry spells that bake the soil hard. This combination of conservation agriculture, and more suitable plant varieties, is leading to greater productivity, contributing to an increase in dietary diversity and enhanced food and nutrition security. Before the rains in March 2013, and based on her experiences at a local Farmer Field School, Mwancha Amisse added layers of dry grass to increase the soil’s capacity to absorb water, and to reduce run-off and erosion. Following the heavy rains, she found that the layers of dry grass had significantly reduced topsoil erosion compared to areas where it hadn’t been applied. Erosion also decreased – while water absorption increased – in plots where farmers had used minimum tilling. While conservation agriculture is often seen as a way of mitigating the impacts of drought, these outcomes showed that it can also mitigate the impact of floods. Which is why, in addition to using soil cover to improve moisture retention and sowing more plant varieties to spread their risk, the women of Wiwanana Wa Tiane Agriculture Association in Namizope have also decided to incorporate drainage systems in their fields. ‘We are going to be sure to include a way for water to flow out of our fields, but in ways where our crops will not be washed away with it,’ said the Association’s president, Alima Chereira. Farmer Field Schools’ emphasis on farmers as decision-makers helps rural communities, and especially women, to build their confidence and capacity to experiment, while also helping people to improve their farming potential.